Financial Standard has conducted the search for the FS Power50 once again in 2018, revealing the 50 most influential financial advisers in Australia. This list is made up of the 50 most influential financial advisers in the country according to the readers of Financial Standard and FS Advice - The Australian Journal of Financial Planning. In the making of this list, we defined 'influential' as individuals who have been, or continue to be, instrumental in shaping the future of the financial advice industry. Nominations were open to all Financial Standard and FS Advice - The Australian Journal of Financial Planning readers only. The Financial Standard Power50 list is made up of the 50 most influential financial advisers in the country according to the readers of Financial Standard and FS Advice - The Australian Journal of Financial Planning. In the making of this list, we define 'influential' as individuals who have been or continue to be instrumental in shaping the future of the financial advice industry. These are financial advisers who have actively participated in industry-based activities, community-based projects and/or other initiatives designed to promote the important role that financial advisers play in the country's socio-economic future. They could be active participants of relevant industry associations, financial advisers with strong social media following, or those known among their peers and the industry as role models in the way they conduct their professional practice. They are also successful business owners, award-winners, policy influencers, mentors and educators. As part of the selection process, we will invite relevant industry associations to nominate outstanding members of their associations and combine that list with the list of nominations from the Financial Standard editorial and research teams. 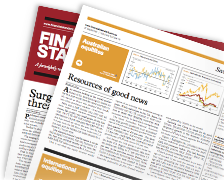 Financial Standard will nominate outstanding advisers based on feature and profile stories we have done on FS Advice - The Australian Journal of Financial Planning in the past 12 years. Then we open up the nomination process to our readers, ensuring we cast the net to the widest set of nominees. Following this, a shortlist of financial advisers who get the highest number of nominations proceed to the voting process, which is once again open to our online readers. They can choose to vote for one or as many advisers featured in the shortlist. All shortlisted candidates will be screened to ensure they are fully-licensed advisers, have met minimum professional educational standards and are members of at least one industry association. The 50 individuals who attract the highest votes and pass the final editorial vetting screen will be featured in our Power50 Most Influential Advisers Guide, out November 26 this year. Did you know that Financial Standard has published the Power 50 Guide of the 50 Most Influential Social Media Users in Finance. You can order the latest issue here.